This is the world’s first glimpse of the next stage in Triumph’s water-cooled classic range – a 900cc Bonneville. The unveiling of Triumph’s impressive water-cooled Bonneville T120, Thruxton duo, and the entry-level Street Twin have left a large hole in the range for a cheaper, retro-styled bike in the mould of the previous-generation Bonnie, and this is it. If your desires and budget fall between the Street Twin and the T120, the only option at the moment is to grab one of the last of the current-model Bonnevilles, still officially in the range for 2016, but set to be phased out by the end of the year as they lack Euro 4 compliance. 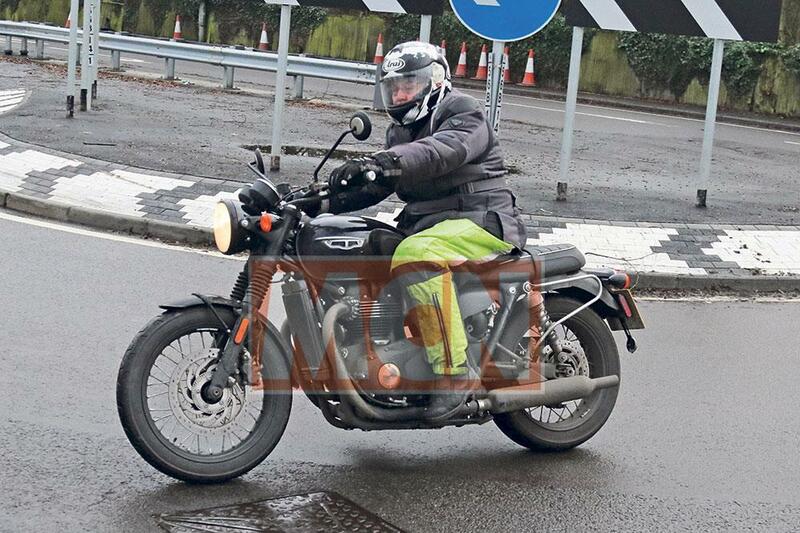 These spy shots show the bike which will fill that gap in the range; a more affordable Bonneville, with a variant of the 900cc motor used in the Street Twin – although it could be released in a slightly higher state of tune to give it a performance advantage over the 55bhp Street Twin. The current Bonneville T100 makes 68bhp, and that seems a sensible target for the new model as well. 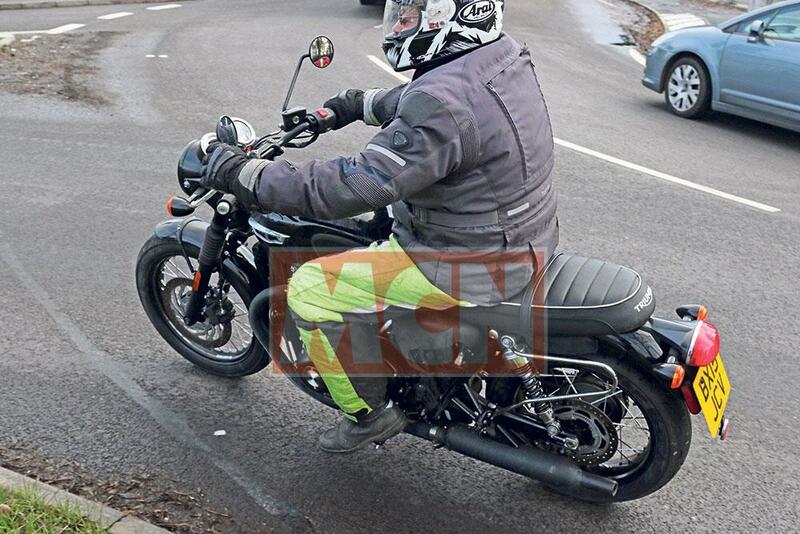 How do we know this bike is the 900cc version rather than the already-revealed T120? The two look near-identical, but there are key clues. Most obvious is the single front brake in place of the T120’s twin-disc arrangement. This has been achieved by replacing the whole front end, including the fork, with the Street Twin’s set-up, which have no mounting lugs for a caliper on the righthand side. This prototype also has the same drilled metal throttle body cover as the Street Twin, while the T120 gets twin throttle bodies, each styled to look like a traditional carburettor. And the final clue is the presence of badges on the engine, just at the bottom of each cylinder, which boldly state: ‘Bonneville 900’. The other components are largely identical to the T120’s, including the wire wheels, longer mudguards front and rear, a T120-style fuel tank complete with rubber kneepads, and a piped T120 seat. Overall, the style is most similar to the T120 Black, with little chrome and a black finish on the engine and exhausts, although this could be due to its prototype status. Like all the new water-cooled Triumph twins, the new Bonneville will benefit from a host of modern technology. The throttle is ride-by-wire, allowing the use of traction control, and there may well be multiple rider modes, as on the T120. ABS will be standard, of course, as it’s mandatory on new bikes from January 2017. Given that the old-model Bonneville will be phased out before the end of the year, we’d expect Triumph to officially reveal this new model in November or December at one of the major motorcycle shows, as a 2017 model.